The Front Line Blu-ray. The storyline is simple, and like Joint Security Area takes a single incident - in this case the capture of a strategically unimportant hill that will later be used to indicate the demarcation line between the two nations - and uses it as a symbol for the entire war. Owing largely to the fact that the tension never really dissipated between North and South Korea following their three years of bloody conflict (1950-1953), the Korean War continues to exert a singular fascination on the South Korean psyche. To this day the US military maintains a controversial presence in the border region, all South Korean males are required to undergo two years of military service and the intermittent threat of invasion from the nuclear barbarians of the North has given rise to numerous bouts of panic and fearmongering over the past six decades. 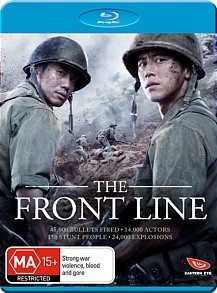 The latest Korean film to mine this ever-popular thematic territory, The Front Line is an unashamed epic of Saving Private Ryan proportions that is proud of both its scope and bombast: in lieu of a tagline, the box cover simply states: ’45,000 bullets fired. 14,000 actors. 150 Stunt People. 24, 000 explosions.’ Enough said, in my book: I’m not sure how many explosions were in JSA and Brotherhood, but I bet it was way less than 24,000. Whilst not quite as beguiling and emotionally charged as those two films, owing largely to the lack of the inimitable Song Kang-ho and a preponderance of the stock characters (prankster, loose cannon, grizzled old timer, brash upstart etc) without which no war epic would be complete, The Front Line is still a remarkably accomplished and hugely ambitious exploration of this singularly calamitous era. It’s also been remarkably well-received both at home and abroad, winning Best Picture at Korea’s version of the Oscars, the Grand Bell Awards, and garnering almost unanimous praise from foreign critics. The storyline is simple, and like Joint Security Area takes a single incident - in this case the capture of a strategically unimportant hill that will later be used to indicate the demarcation line between the two nations - and uses it as a symbol for the entire war. The performances, if not the characterisations themselves, are almost uniformly strong, and the literally (and liberally) explosive battle sequences begin a mere 8 minutes in, director Jang Hun evidently having learnt from Spielberg not to faff around with too much in the way of exposition. It’s a worthwhile entrant into the canon of great Korean war movies, and a potent, pointedly dramatic one at that. A fairly detailed and enjoyable Making Of Featurette, a Highlight Reel, and several Trailers.